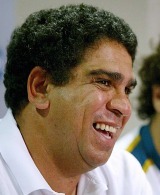 Ella made four appearances for the Wallabies between 1982 and 1985 beginning with his international debut against Scotland in Brisbane. He had to wait over a year for his second cap against Italy and it was a further two years before he would win his last two caps against Canada and Fiji. He was assistant coach to Bob Dwyer with the Wallabies during the 1995 World Cup in South Africa but, when Greg Smith, Dwyer's successor, was fired in 1996, Glen went too. He took his family to England and coached Stourbridge for six months. He was later technical adviser to the Super 12 side the Brumbies and also had a spell as coach of the Australian sevens team. He also served as Wallabies assistant coach under Eddie Jones and took on a similar role with Canada ahead of their 2007 Rugby World Cup campaign. In 2009 he was appointed to a four-man Fiji Rugby Union selection panel. His brothers - fly-half Mark and centre Gary - also earned international honours and together they were stalwarts of the Randwick club in Sydney.